How opening balance should be imported depending on your old system and preference. You should import Year To Date amount from the last pay run in old system to HeroPay. - Go to Payroll Setting/ Opening Balance. - Select Export button on right hand corner. - From Data Type drop down menu, select Template with employee data (including terminated employees). NOTE: Opening Balance should include Terminated Employees who have received payment in current financial year. E.g. current FY is 2018/2019 and you transited to HeroPay in middle of the year, opening balance should include all employees who received payment in 2018/2019, including those who have been terminated in old system. If you do not import OB for employees who were terminated in old system and received payment in 2018/2019, you would need to generate payment summary for those employees from old system. - Select Import button on right hand corner. If you make mistake during first import, you can change the data using one of above options. New data will overwrite existing data in employee’s opening balance. Ensure Initial Financial yeat selected in Payroll Setting/Opening Balance page is correct and do not change the year once you have set it up, employee’s opening balance is related to this Initial Financial Year. Once you migrate to HeroPay and enable Single Touch Payroll, you have option to use new BMS provided by HeroPay or keep BMS from old payroll system. Option 1: You can change the BMS ID to the original/previous BMS ID if you transfer all YTD employee wages to HeroPay. Instructions on how to do this are provided above. Option 2: If you transfer all YTD employee wages to HeroPay and you DO NOT want to revert to the original/previous BMS ID (that is, you want to keep the new BMS ID) you will need to zero the employee YTD values from the old BMS ID (and hence old payroll software). This will need to be done via an update event in order to prevent duplicate information being submitted to the ATO. Refer to your old payroll platform instruction to lodge update event. 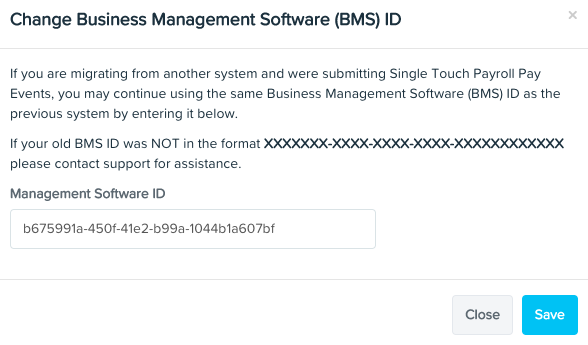 Option 3: If you do not transfer YTD employee wages to the new payroll system and you DO NOT want to revert to the original/previous BMS ID (that is, you want to keep the new BMS ID), you will be required to finalise employees reported under the original BMS ID. That is, the final pay event under the original BMS ID (ie the previous payroll software) will need to be marked as a final pay event. Refer to your old payroll platform instruction to lodge final pay event. If you select Option 1 or 2, i.e. transferring all YTD employee wages to HeroPay, follow instruction from 1 of above 2 options to Import Opening Balance. If you select Option 3, i.e. not transfer YTD wages to HeroPay, you are still required to importing employee’s leave balance after the last pay run in old payroll platform. Follow instruction from 1 of above 2 options to Import Opening Balance, however, you are only required to import leave balance. Once you have finished the transition to HeroPay and started reporting under STP via HeroPay, you should not change BMS ID during the financial year since at this stage, employee's YTD amounts associated with the BMS ID are already lodged to ATO. Changing BMS ID during financial year on HeroPay will potentially lead to duplicated reporting of employee's YTD amounts to ATO.